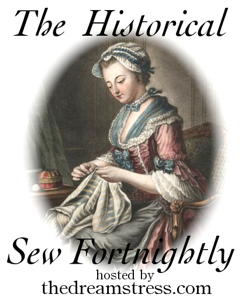 For “The Historical Sew Fortnightly’s” (link) 10th challenge – Literature – I had to think long and hard on what to make. I didn’t have the time to make a whole garment from scratch, so I decided to finish a dress I’ve been working on since january. 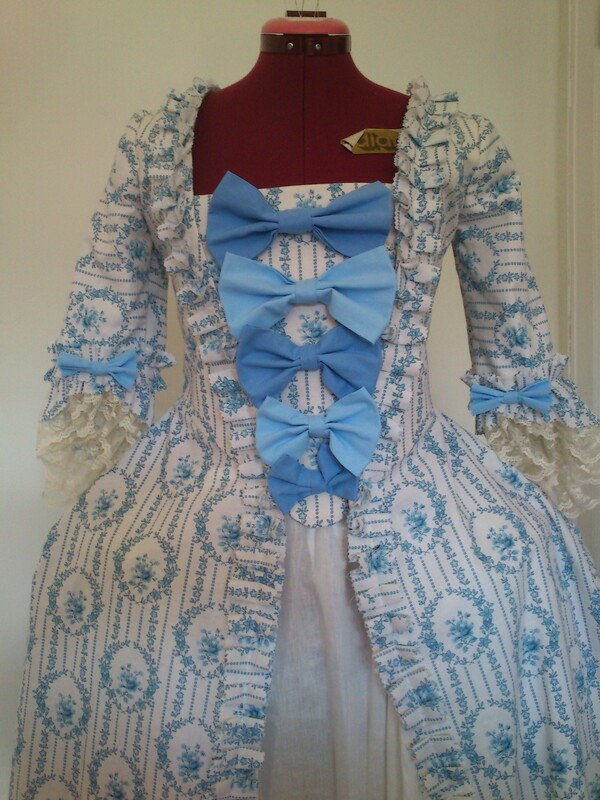 I have promised a Robe a la Francaise to my sister Maria for over a year and never really had the time to make it. But now it was finally going to happen. I bought the fabric from an online auction site last may. 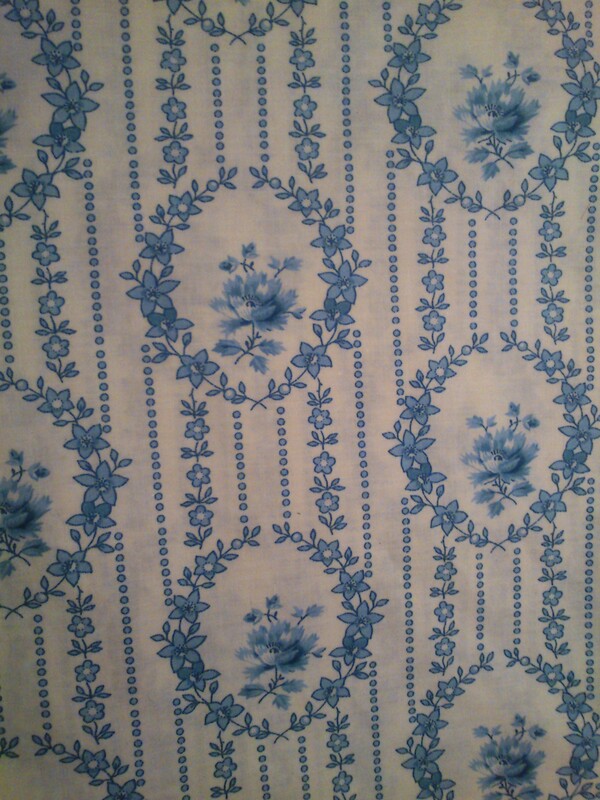 It is a flower printed cotton made for quilting and home decoration. 120 cm x 7 m fabric for 200 SEK (about 30 USD). I think the fabric is lovely and the stripey pattern reminds me of some of the inspiration gowns I and my sister looked at when we tried to decide the final look of the gown. 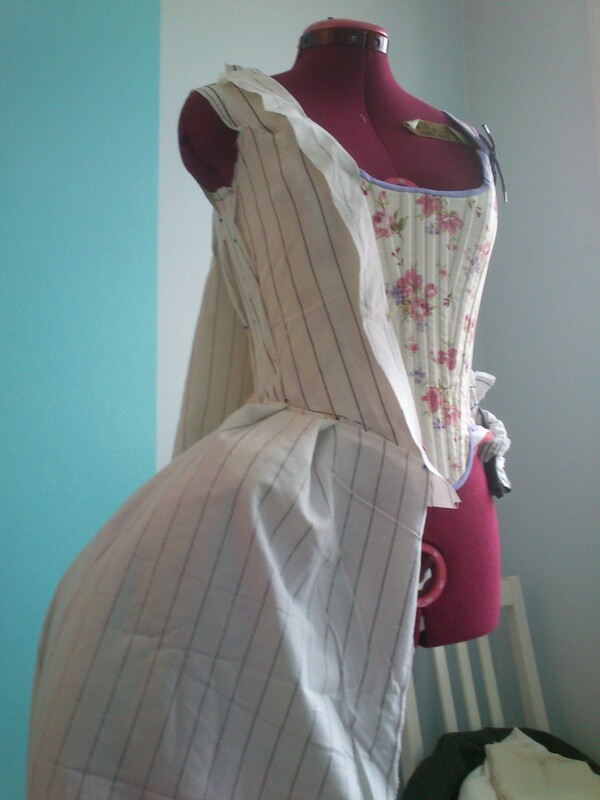 I used three of my favourite pattern books for references when draping the bodice: Arnold, Waugh and Baumgarten. 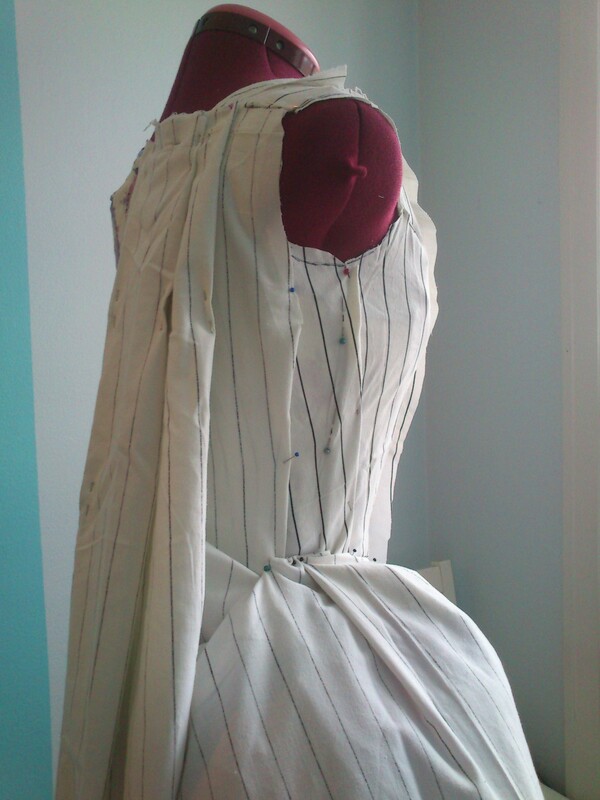 After taking the measurements I needed on my sister, I put her corset on the dressform and started to drape. It went fast and easy and in no time I had a nice looking pattern. I then cut and sewed the mock up for the bodice. Then it was time to travel the 3 hours by train to my sisters home town for the first try on. And the fit was terrible, the shoulders didn’t fit, the waist was way to long and the front just wouldn’t sit where it was supposed to. I ended up draping a whole new mock-up directly on her body. I went home confident I had a working pattern and started cutting the fabric the next day. The sewing went quick and easy, starting with the bodice lining and putting some gromets and lacing in the back for a better fit. 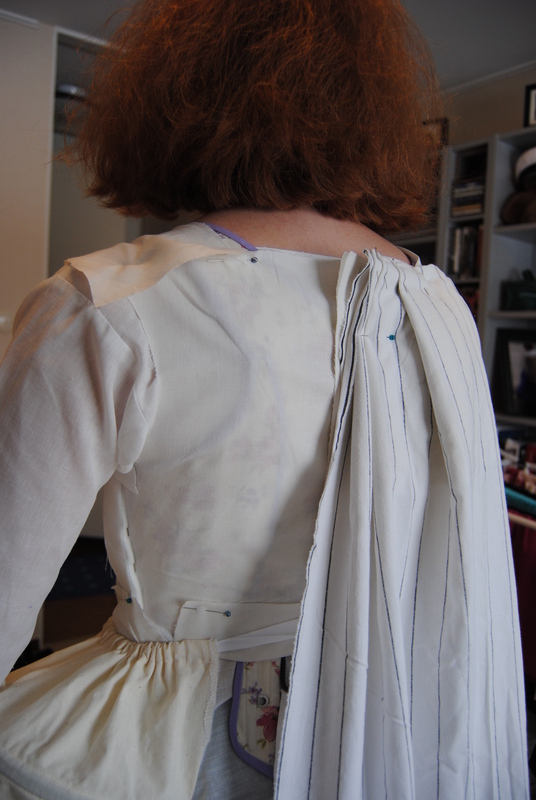 I draped and put the loose back on the lining, and sewed it down to the bodice side seams. The skirt parts was pleated at the sides and sewed on and the sleeves was lined and sewed together but left lose until the next try on. 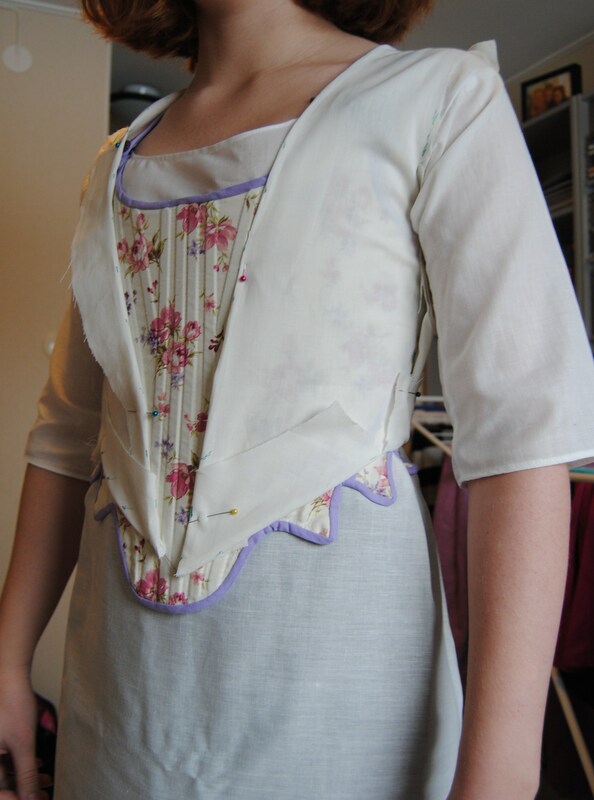 I cut and sewed the petticoat to the waistband, sewed and boned the stomacher and started on the trimming. Then once again I met with my sister for a try on. And this time it fitted almost perfectly. Make and sew all the trimming on. I was relieved that it wasn’t more to do or change since I just realised I only had 3 days (of wich I would be home for one evening) to do all this finishing, before we were supposed to have the final photoshoot. After a lot of handsewing on my worktrip (on the train, bus, aeroplane, hotel etc.) I managed to get the dress done in time. Here are some pictures of the finished dress on my dress form. Pictures from the photoshoot will be shown in a later post. 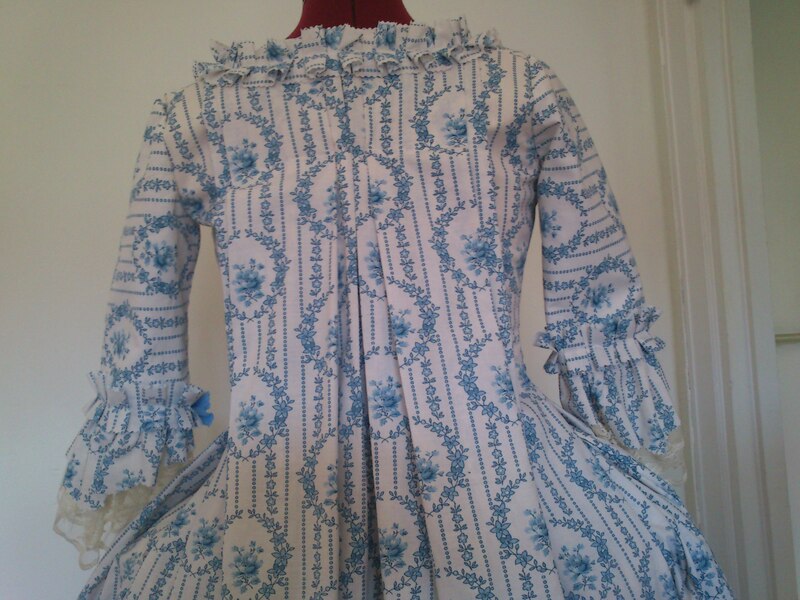 Fabric: 6 m printed cotton, the bodice is lined and interlined with white cotton fabric. 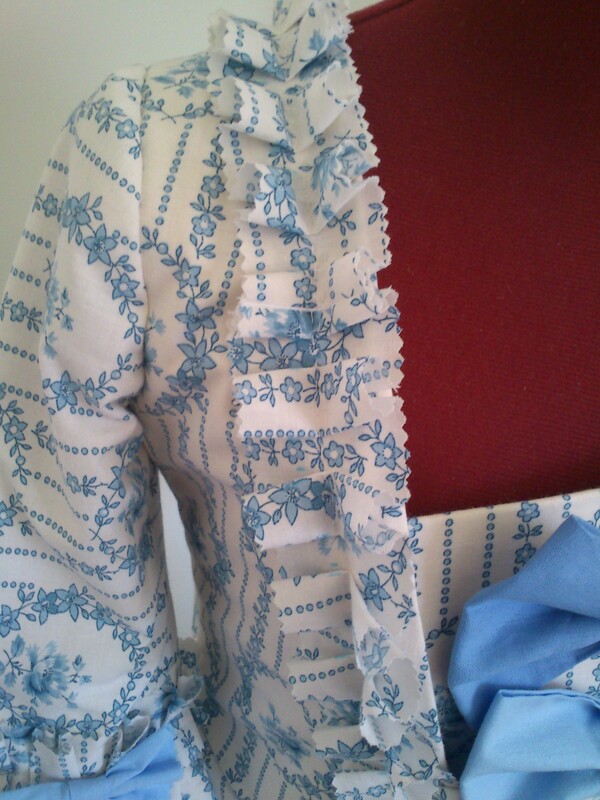 Pattern: I draped my own pattern based on Baumgartens “Costume close-up” gown 2 – Robe a la Francaise with polonaise. 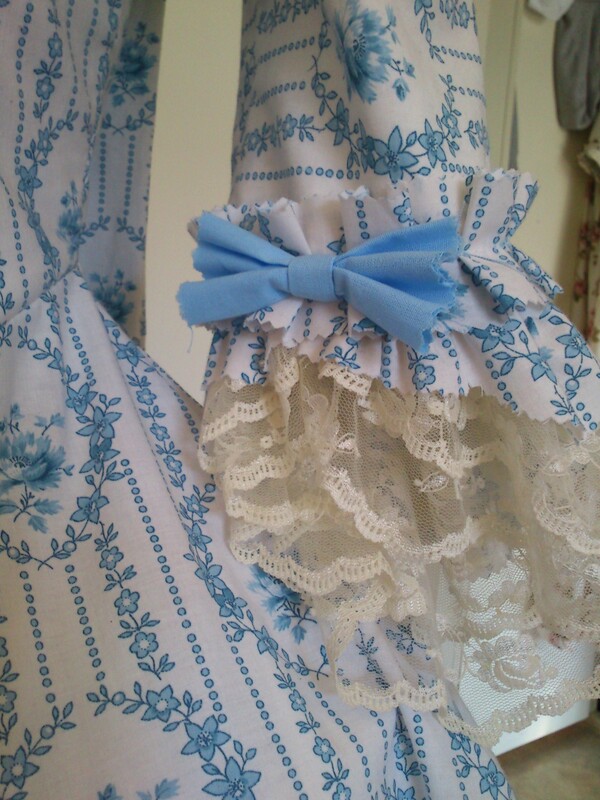 Notions: Thread, hooks and eyes, lace fabric, blue cotton fabric for bows and cotton string for the polonaise. 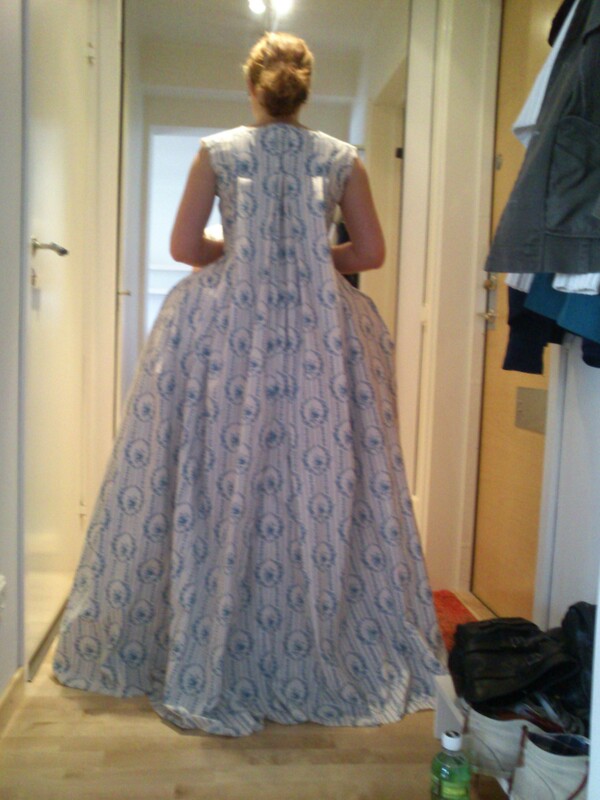 How historical accurate: Mostly machine sewn – I only had one chance to try the dress on my sister and had to sew it really fast. The pattern and over all look of the dress is fairly accurate. But probably not more than 40%. Hours: I didn’t count but probably 40 something. First worn: May 9th, for the photoshoot. 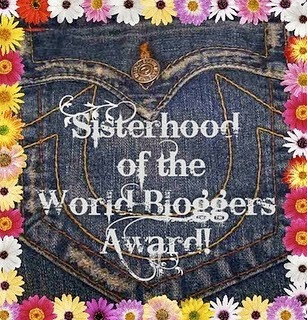 Welcome to blogging! Very pretty job, and what utterly gorgeous fabric! The pleated trim is just fantastic, and the sweep of the back pleats is swoon-worthy. The one reservation I have is the bows – they look a teeny bit too stiff and precise and clinical for my taste. Maybe softer bows with ribbon? 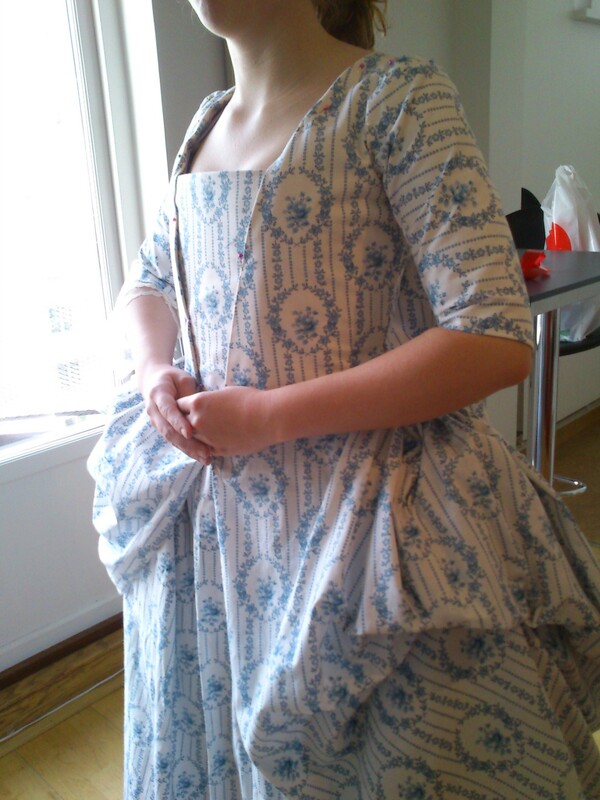 Or a different style of stomacher? P.S. I’m so pleased that your blog allows comments without my having to be logged into an account! I am also a bit unsure about the bows, I think they look kind of costumy. But I could´t find any ribbon that i liked that didnt´t looked cheep. mayby I can do some other kind of decoration like lace or some more pleated trim. Hm, this is definetly something worth thinking about. I LOVE the whole look of the outfit; the daintiness of the pattern is *perfect* for the look/feel of the gown.. I may just have to try the moire ribbons. that sounds really pretty. Jolie Française ! Pour le moment, elles me font encore assez peur. Leurs plits surtout ! Oh, Thank you! Yes they are a bit scary, but not as hard as I would have tought.